Fans continue to search for "Becky". Rachel Roy has finally denied rumours that she is the woman that Beyonce referred to in a song about cheating on Beyonce’s new album ‘Lemonade’. Since the album was released on Saturday, fans have eagerly been hunting down the identity of Beyonce’s “Becky with the good hair”, mentioned on her new song 'Sorry'. However Roy, who has been at the centre of allegations, has now officially responded. "I want to put the speculation and rumors to rest. My Instagram post was meant to be fun and lighthearted, it was misunderstood as something other than that," she told People magazine. "There is no validity to the idea that the song references me personally. There is no truth to the rumours." She continued: "Consequently, online haters have targeted me and my daughters in a hurtful and scary manner, including physical threats. "As a mother – and I know many mothers would agree – I feel that bullying in any form is harmful and unacceptable. Meanwhile, Rita Ora has also denied being "Becky", following growing rumours online. Beyonce’s new album ‘Lemonade’ is now available for download through iTunes, following its short exclusivity on TIDAL. However its currently not available on Spotify. Beyonce’s surprise ‘Lemonade’ album has made headlines for a number of reasons, including allegations that Jay Z has been unfaithful. The album, which premiered during an hour-long HBO special, infers that Beyonce’s husband Jay Z may have cheated on her with another woman. During a new song called ‘Sorry’, Beyonce references somebody in a very cryptic line: “He only want me when I’m not there,” she sings. “He better call Becky with the good hair." Interestingly, part of the Jay Z/Roy cheating rumours allegedly come from his infamous elevator incident with Solange at the Met Gala after-party. 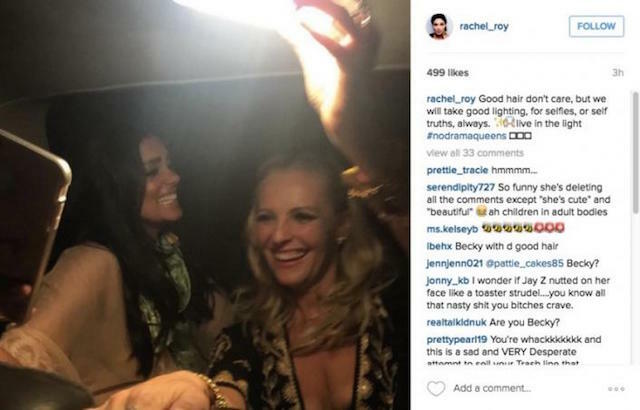 At the time a number of outlets, including US Weekly, reported that the argument was sparked because of Jay Z’s flirtation with Rachel Roy at the event. Roy, who is also the ex-wife of Jay Z’s former business partner Dame Dash, has since been attacked by the BeyHive for her Instagram post. The fan group have flooded her comments with lemon and bee emojis, as well as a number of insults. However she has since responded with a cryptic post on her Twitter account. So far there has been no official comment from Jay Z or Beyonce.